> Hazelnut Ground Coffee, 1 lb. 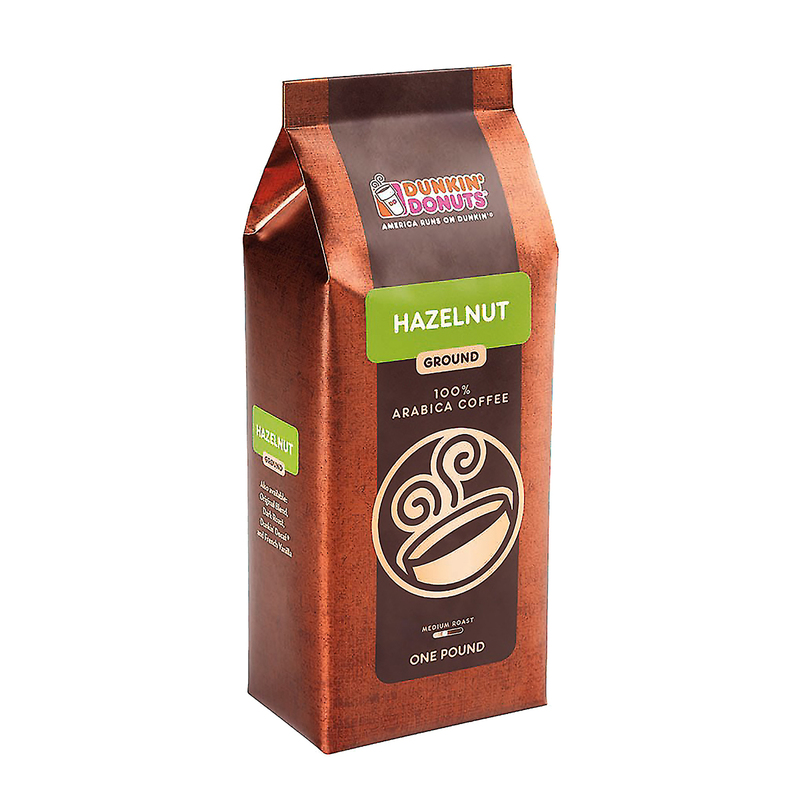 Diverge from your normal coffee routine, and try Dunkin' Donuts® 1 pound Hazelnut ground coffee. The sensations provided by a single cup will kindle your passion for quality coffee. Stock your own kitchen with this nutty blend, and order extra packages to share the experience with friends and family. We choose only premium beans and grind them right before delivery for the freshest taste possible. Dunkin' Donuts® Hazelnut coffee is more than just a hot beverage; it delights your senses and satisfies your need for a great start to any day. The combination of 100% Arabica beans and roasted hazelnut gives off a soothing, sweet aroma. Rich color swirls harmoniously with cream as you add your favorite sweeteners and you'll appreciate the velvety texture with every warm sip. Flavorful roasted coffee with hazelnut flavor will perk up even the groggiest of snoozers. All these sensations combine to create a pleasant change in your morning routine. Americans love drinking Dunkin' Donuts® coffee at home because we place quality at the top of our list. The Arabica beans found in our hazelnut blend, which the industry regards as a superior grade of coffee, are processed by our Dunkin' coffee experts, who taste an average of 200 cups of coffee every day to ensure quality and consistency. Thorough taste-tests ensure that you receive only the best, and we grind each one-pound package to the perfect consistency for optimal flavor. Order Dunkin' Donuts® Hazelnut ground coffee online, and experience change with a whole lot more taste.